Flea Treatment: Fleas Biting You this Summer? Fleas are persistent pests and a pain in the rear for our pets and their humans. Several species of fleas may be pests in Florida. Fleas are small (1/16 inch), red-brown, wingless, blood-sucking insects. Their bodies are laterally compressed (flattened side to side), permitting easy movement through the hairs on the host’s body. Their legs are long and well adapted for jumping. The mouthparts of an adult flea are adapted for sucking blood from a host. Flea treatment is a necessity if you own pets in Florida and most of the United States. The cat flea is the most common. Cat fleas may attack a wide variety of warm-blooded animals including dogs, humans, chickens, rabbits, squirrels, rats and mice. Although the dog, human, and stick-tight fleas are also found in Florida, multiple species of fleas may be found on a single animal. Fleas breed in large numbers where pets and other animals live. Pets infested with fleas bite and scratch themselves. Their coats become roughened, and the skin can become infected. 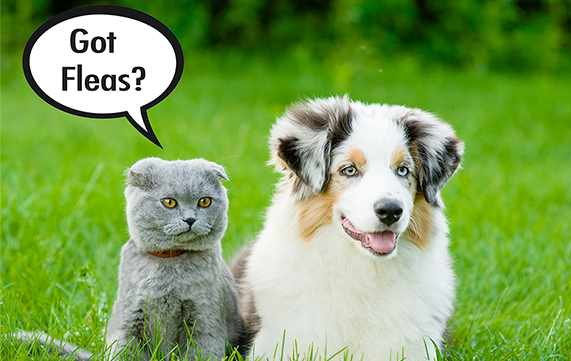 Cat fleas and dog fleas may also be hosts for tapeworms. A flea bite leaves a small red spot where it has inserted its mouthparts. Many people do not react to flea bites at all, while others are sensitive and suffer severe allergic reactions. Fleas may also carry human diseases such as the plague, typhus and tularemia. In order to successfully combat a flea problem, you have to attack it on two fronts: 1) treat the pet; and 2) treat the premises. Although on-animal flea control is the most popular and effective method of controlling fleas, all areas of the home and yard should also be treated. When the animal is treated with an internally taken product or certain topical flea treatments, the fleas jump onto the treated animal as it moves through infested areas and when it bites, it receives the fatal dose of pesticide so that it won’t reproduce or move in to your pets fur. Other flea treatment options are liquid wash products in which fleas are either killed by contact. Flea treatment on pets alone isn’t usually sufficient. Fleas may continue to infest your yard and home and get right back on your newly cleaned and treated pet. Treating the home and yard with liquid flea treatment is usually a needed step in order to stop the infestation or t make the infestation stop faster. This is extremely important for those who have animals or family members with flea allergies. It’s also makes a huge difference for those who have carpets and large lawns where fleas can infest and continue to re-infest pets. Oral flea medication prescribed by veterinarians can provide the control of fleas when pets are not allowed outdoors. Many of these products can kill fleas before they have a chance to bite flea-allergic animals. With this method of treatment, much less product is used than for insecticide treatment of premises, which mainly kills the immature stages of fleas. Topical or spot treatment provides effective residual control. To be certain pets remain free of fleas, it is necessary to make routine use of flea control products, especially if pets are allowed contact with infested animals or premises. Flea-free pets can become re-infested with fleas from their environment. For the most effective control, sleeping areas, bedding, kennels, and other areas frequented by the animal should be treated at the time the pet treatment is made. All rugs should be thoroughly cleaned with a vacuum cleaner or a steam cleaner. Infested furniture, pet baskets, and cracks should be thoroughly cleaned to prevent the larvae from finding food. Dirt that is collected should be disposed of immediately to destroy fleas and flea larvae. Insecticides should be applied inside the house carefully as light spot treatments to areas where fleas are known to be hiding. These can be applied indoors as crack-and-crevice or surface treatments. For heavy infestations with egg masses, contact a professional immediately. Infested areas should be treated by applying a broadcast treatment of insecticide to the landscape. Special effort should be given in treating areas frequented by pets. Applications at two-to-four-week intervals may be necessary to eliminate the fleas. We offer both traditional pest control options and organic pest control options. Our staff at Green Earth Pest Control is experienced in eradicating flea infestations. Give us a call if you are having problems and we can help you determine how bad the problem is and in what ways you may want to start treating. You, your pet(s), and your family will be happier and healthier! Is Your Lawn Lagoon Friendly? Ask Us How. With over 20 years of experience, Green Earth Pest Control is a locally owned and operated by professionals who are trained with pests and diseases that effect our clients on the Space Coast. We proudly serve both residential and commercial customers in Brevard and Indian River Counties. Our normal hours are 9-5, Monday through Friday.